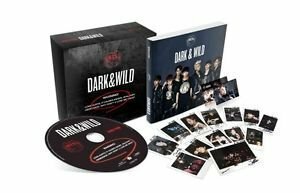 1st Album [DARK & WILD] from BTS consists of CD, two PhotoCards and 102p PhotoBook with factory sealed from manufacturers. The CD has 14 songs as follows. Tracks 01. Intro : What am I to you 02. Danger 03. 호르몬 전쟁 04. 힙합성애자 05. Let Me Know 06. Rain 07. BTS Cypher PT.3 : KILLER 08. Interlude : 뭐해 09. 핸드폰 좀 꺼줄래 10. 이불킥 11. 24/7=heaven 12. 여기 봐 13. 2학년 14. Outro : 그게 말이 돼? If you have any questions about this product by LOEN Entertainment, contact us by completing and submitting the form below. If you are looking for a specif part number, please include it with your message.